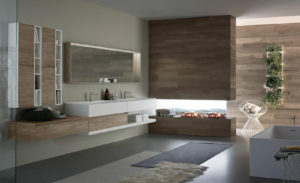 LUNARIA system of bathroom furniture by Antonio Lupi. “Complicating is easy, it is difficult to simplify. To complicate just add everything you want: colours, shapes, actions, decorations, characters, environments full of objects. Anyone can complicate. Few are able to simplify. To make it easier it is necessary to remove, and to do this you must know what to take off. Remove instead of adding means to recognize the essence of things and to communicate them in their essence” by Bruno Munari. Carlo Colombo has taken inspiration from this concept to design the new system LUNARIA. A furniture distinguished by the absence of handles in sight, replaced by a recessed handle, that revolves around the furniture. Characteristic that, in addition to an aesthetic appearance, has the function to facilitate the opening of the door. This collection consists of hanging elements (h. 37.5cm and 50cm with widths from 45 to 216 cm), as well as freestanding elements (45×45 h. 85cm ), several wood essences and opaque and polished lacquered colours (as per antoniolupi palette of colours). 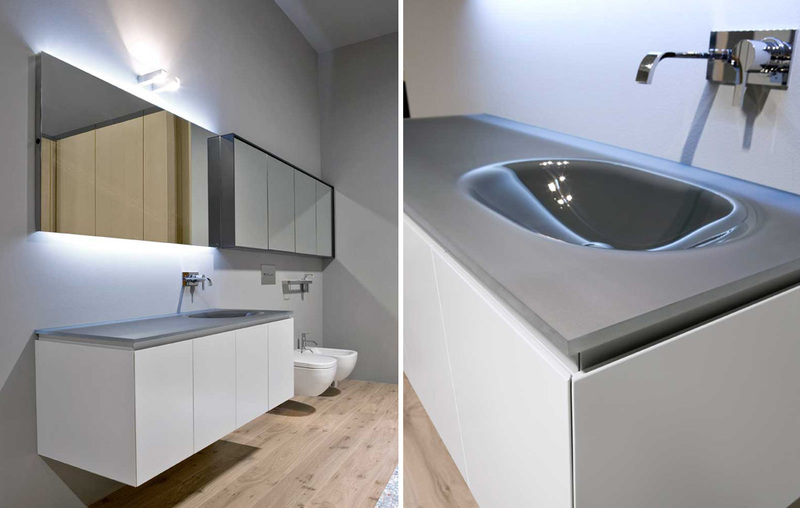 The cabinetry from this collection can be fitted with integrated tops in Corian®, Segno and Myslot by Antonio Lupi. (CSA approved). 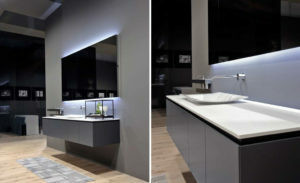 Glass tops with undermount sink (CSA approved). Integrated glass tops from Antonio Lupi are not CSA approved. 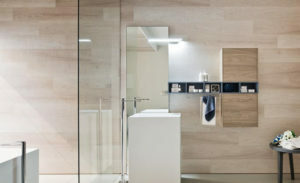 Antoniolupi is a world-class leader in the design and manufacturing of top-quality, modern bathroom furniture, fireplaces and living room elements. The distinctive features of this ever-developing company are its ability to innovate by continuously searching for new materials and designs, while investing heavily in manufacturing technology. antoniolupi product line embraces the entire living space, thanks to the collaboration with established designers, such as Carlo Colombo, Nevio Tellatin, Riccardo Fattori, Mauro Carlesi, Domenico de Palo and Paolo Armenise. A guarantee of top quality is antoniolupi’s long-standing mission. Precision manufacturing, high-quality raw materials and attention to details mark each step of the production process. Please contact us regarding shipping 14-16 weeks.